If you’re a regular Automated Home reader you’ll have noticed a few electric car stories creeping in over the last couple of years along with more Tesla coverage (including their Powerwall) too. I got a quick indoor passenger run in a Model S earlier this year while at the Gadget Show Live at the NEC and had the option to tick a box for a test drive. Currently Tesla have no store or service centre in Ireland, North or South [UPDATE – they do now]. This is set to change within the next 6 to 12 months but for now Tesla bring over a couple of their cars several times a year for test drives. 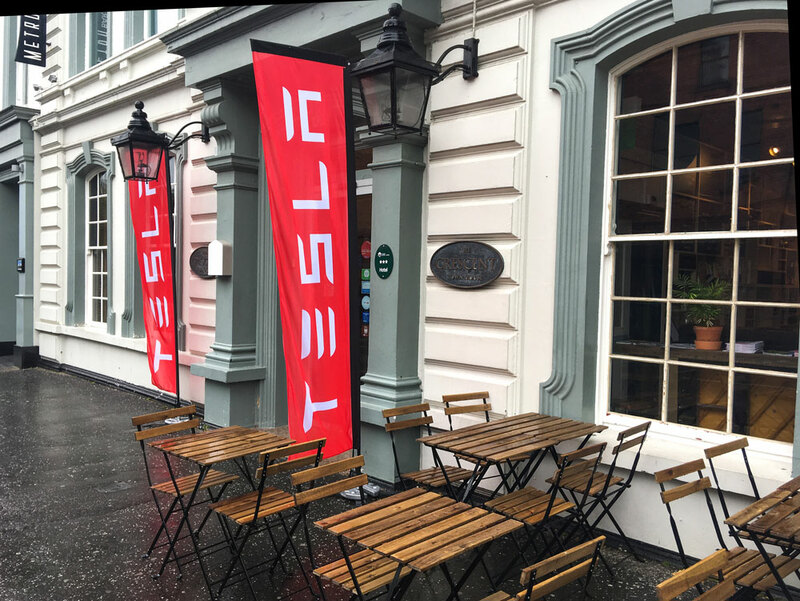 So we headed out on a wet Friday morning last weekend to a hotel in Belfast for the pop-up Tesla test drive centre. 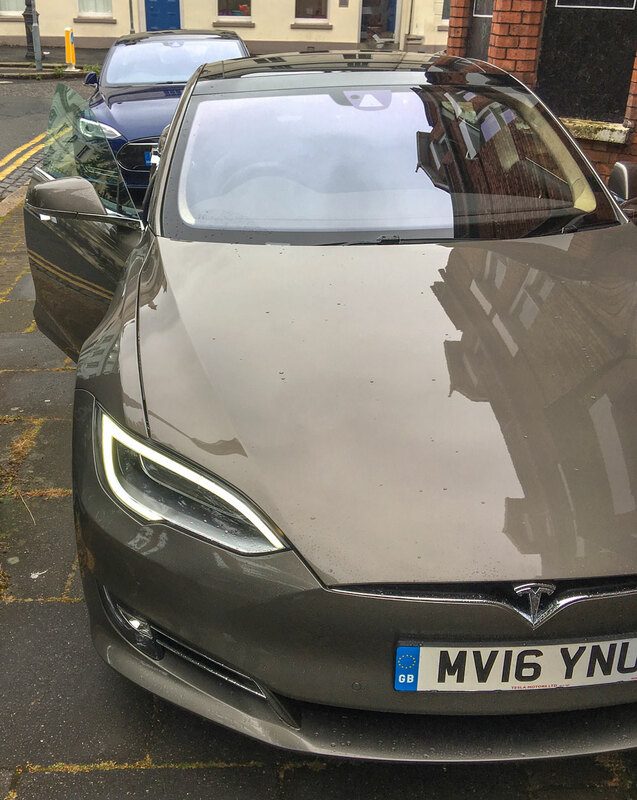 If you’re a nerd then you probably already know most of the stats for the Tesla Model S. It’s hard to form any sort of complete opinion on a short drive, but here are a few impressions from an hour with the car. Our demo car was the previous shape model, the Deep Blue Metallic car in the photos. There was also one of the new face-lifted models in Titanium Metallic (a bit beige for my liking). 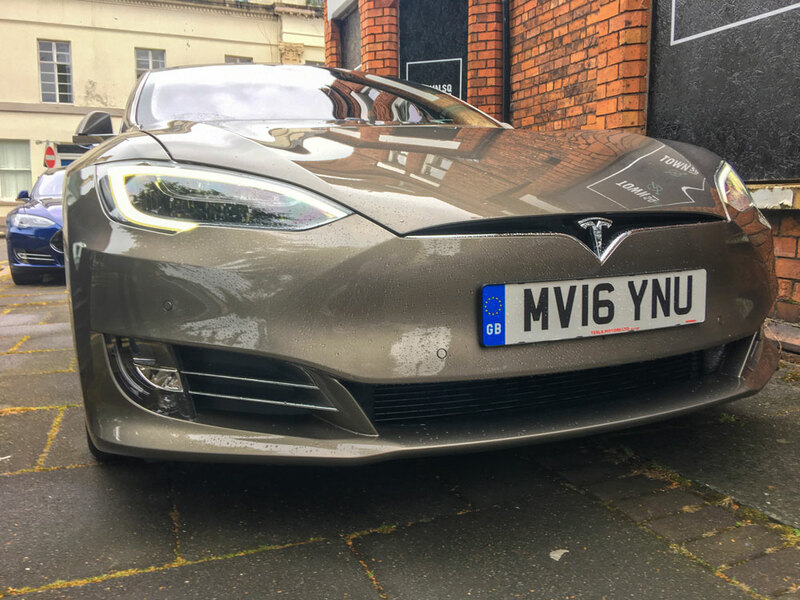 Our Tesla guy told us there are over 300 new parts in the 2016 Model S. As well as the cosmetic changes to the front end the radar has been lifted from below the number plate and moved behind that floating Tesla T grille badge. This makes it much less likely to get blocked with snow if you live in a country with harsh winters. There are some other nice little details for example those air intakes on the inside of each foglight at the front are normally closed off for reduced drag, but can actively open when the battery needs more cooling. Interestingly all the new 60 kWh entry level cars actually have the 75 kWh battery fitted. It’s then software locked to 60kWh, leaving you the option to unlock it at any time in the future (with a payment of around $10,000). This raises the 60’s standard 248 mile range by around 50 miles and raises the top speed from 130mph to 140mph (0-60 time unchanged at 5.5 seconds). The inside is airy, especially as our car had the optional panoramic glass roof which gives 3 inches of extra headroom according to our Tesla rep. The second generation seats seemed great, but I’d need a drive to Cork and back to really test them. The rear doors are a little small due to the coupe like shape but they are adequate. You can feel how light the doors are too, due to the all aluminium construction. With no transmission tunnel hump down the middle of the car the front centre console is deep and useful and the floor is nice and flat for rear seat passengers. The Interior is dominated by that 17″ touchscreen that’s the interface to all the cars systems. The car is on-line with its LTE connection and all data charges for the first 4 years are covered in the purchase price. There’s Google Maps on the big screen plus a ‘proper’ Garmin based GPS system on the screen behind the wheel that won’t let you down when that cellular data connection disappears. 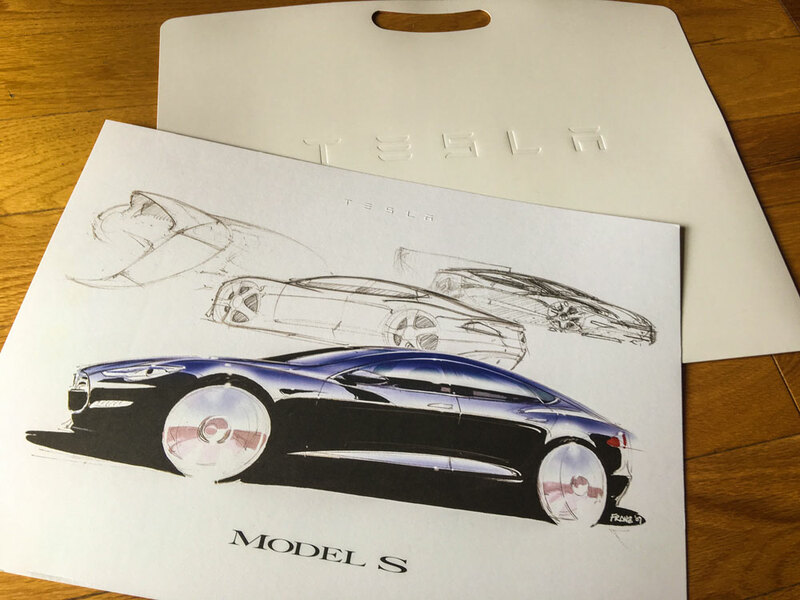 Here’s how to decode a Tesla badge. The number, 90 in this case, refers to the capacity of the battery in kWh. The higher the number the bigger the range. The D stands for Dual Motor, so four wheel drive. The P denotes a Performance model, those with the high performance drive inverter. Lastly having the whole badge underlined means this model has the Ludicrous mode, a further enhancement to the electronics and smart fuse that allows an even bigger current draw for the ultimate performance. As long as you have the key with you the car simply needs a press of the brake pedal to come to life. No button to press even. Everything you’ve heard abut the Tesla acceleration is true. 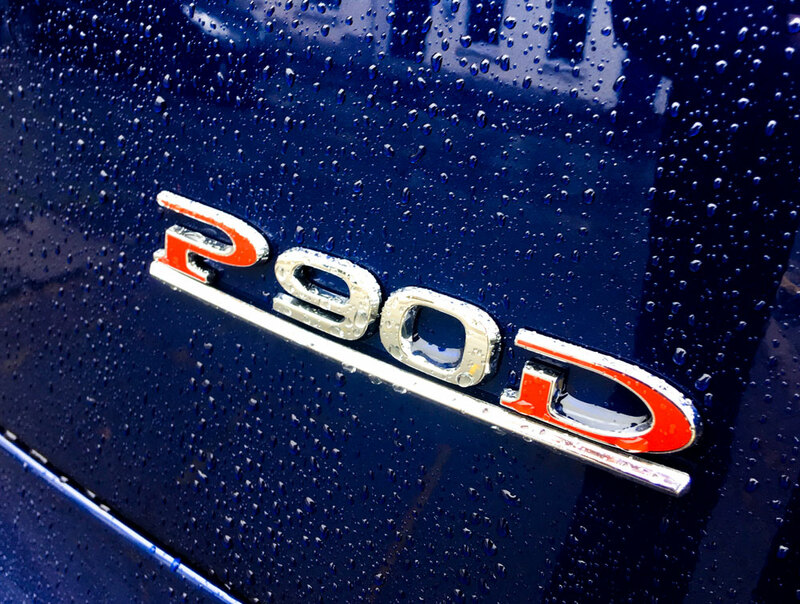 This range topping P90DL with its gargantuan 713 lb-ft of torque does 0-60 in mind blowing 2.8 seconds. You’ll have to spend some serious cash to get anywhere close to that in an exotic supercar and it’s nigh on impossible to find in another 4 door saloon. With a few taps of the touchscreen the test car was set to software limit itself and emulate the performance of the entry level 60/75. Here the 0-60 time rises to 5.5 seconds, that’s still really fast by most car standards. Our car rode on those gorgeous 21″ turbine alloys and standard (non-air) suspension. It felt great and cornering was flat from that famously low centre of gravity. Coming from an automatic we had ‘Creep’ enabled which makes the car roll slowly as soon as you lift your foot off the brake pedal. Brake regen felt pretty aggressive over the first couple of miles but by the end of the test drive I was already well into that ‘one pedal’ driving mode, only needing to touch the brakes in the last few metres of a complete dead stop. We had a quick demo of the Autopilot feature on a well marked two lane ring-road. Shorty after it was enabled a car happened to emerge from a side entry in front of us and the car duly responded by breaking to avoid it whilst steering around the bend. While every car has the hardware onboard for Autopilot as standard, it’s another feature you’ll have to pay to unlock. The recent negative publicity surrounding AP and the people videoing themselves miss-using it threatens to spoil it for the rest of us. I can easily see legislation coming that will make it much tougher for Tesla and others to bring these exciting new features and iterative improvements to users as quickly in the future. And thats especially a shame as the Tesla fleet is currently adding 3 million miles of knowledge per day to the hive mind. And so to the thorny issue of cost. Even that new entry level 60kWh version of the S starts at around £54,000 (before incentives). But that’s not the whole story. There are several optional extras that you’ll probably want to add to this and they make a significant difference to the price. Here are some examples. Adding just 3 of those options can raise the base price by over 20%, although that’s not uncommon in this sector. The ‘Premium Upgrades Package’ adds a lot of features including the new HEPA air filter system with Biodefence mode from the Model X as well as 3 position LED turning (aka adaptive) lights, LED fog lights, Power liftgate, Lighted door handles, Interior accent lighting, Smartphone dock and Alcantara accents. 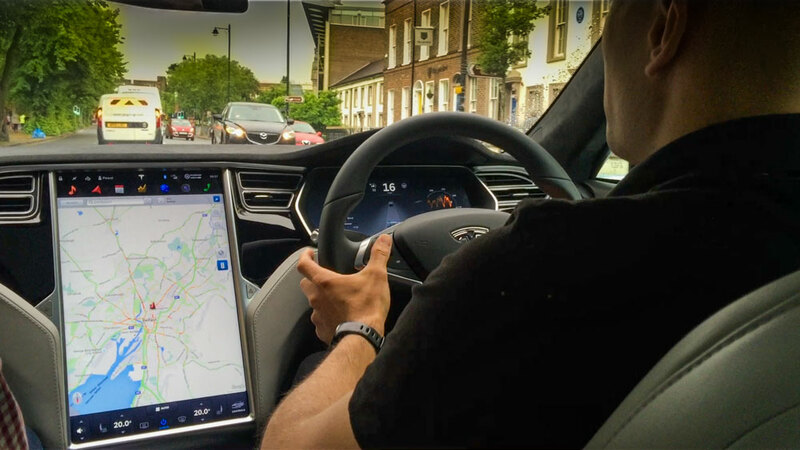 Our Tesla guy told us most people chose a PCP deal as its the cheapest way to get behind the wheel. On the same 60kWh model a 36 month contract with a 10,000 mile per year allowance will set you back the thick end of £30K over the three years, walking away with nothing at the end but free to upgrade to the latest tech. If you’re in the lucky position to be able to afford that then I’d say there’s no better 4 door saloon I’ve ever seen. The Model 3 will provide a less expensive entry into the exciting futuristic world of Tesla. Although judging by those extras above (even with a reduction factored in for the 3 range) it has the potential to be much more expensive car once buyers plump for just a few of those optional, but desirable, upgrades. I had a chat with a few fellow petrol head friends after the test drive. A minority of them see the future as I do, the majority do not. You see even with this beautiful styling, leading technology and incredible performance there’s still a major missing element for the enthusiast – the sound of a great engine. While I think this will always be an issue for our generation, my kids will probably not miss what they’ve never had. For me its an easy moral decision to forgo the sound for the environment. I have to admit that my initial interest in Tesla was more for its tech than its green credentials, but I’ve found its been a bit of a gateway drug that’s led to a craving for more knowledge on the subject of sustainable energy. There’s so much horse manure surrounding electric cars and renewable energy. Much of the popular opinion on these islands seems to come from watching a certain BBC TV series. While I enjoyed it as much as the next man, many still don’t seem to realise the Clarkson era Top Gear was a light entertainment show, and not a factual car review series. If you’re really interested in reading more on the subject I can heartily recommend the book “Sustainable Energy – Without the Hot Air” by the late David J. C. MacKay. I bought a 2nd hand copy from Amazon for under £10 and there’s this free PDF version available too. Be warned though, it will make you feel guilty in your Diesel SUV. A welcomed change from the normal car buying experience then. As I walked away from the hotel with our nice complimentary Model S print, I had a nagging feeling the drive home in my ICE car was going to feel pretty 19th century. 6 Comments on "My Belfast Test Drive in a Tesla Model S P90D Ludicrous"
Damn it, I knew I shouldn’t have clicked on that link. Tuesdays are Euromillions days, here we go. Nice review and video, thank you Mark. It is a nice mini-review, Mark. As you know, I am not a petrol head but I am interested in finding out more about this manufacturer’s cars. It is way out of my league and price range, of course. So when you get one or more, I would like to come over and have a ride in it, please!